I’m pretty sure I haven’t been able to get Gracie to eat Zucchini in almost a year! She use to really like it, but over the past year or so even though I continuously dish it up she says it’s ‘disgusting’. So this week I started to have a think of ways that I could be more creative with sneaking zucchini in via these Sweet Potato Zucchini Tots which are combined them with things she’s already enjoys eating. One of my go to meals that always goes down a treat with hidden zucchini is my Slow cooked Spaghetti Bolognese or my zucchini fritters. These ‘tots’ are a little nutritional powerhouse in themselves with Quinoa and Flaxseed Meal, they’re also Dairy, Gluten, Soy & Egg-free. Chop up the sweet potato and boil until until you can mash easily with a fork. Drain and then mash the sweet potato. Grate the zucchini into the mashed sweet potato and add seasoning. What child doesn’t like pizza? Being a dairy-free home (well apart from my husband) Pizza isn’t something we really eat. However, after our recent holiday when Gracie saw her Pa eat Pizza I promised I would make her one when we returned home. Now I’m no baker, I leave that to my husband when things get too complicated! What I love about this recipe is that it’s extremely simple and you can make it right before you want to use it! If you’re time poor use a good quality tomato pasta sauce (no refined sugar and low sodium content) and mix with tomato paste to make a lovely rich pizza base. As we’re dairy-free I sprinkle with nutritional yeast flakes. Nutritional yeast contains B-vitamins, folic acid, selenium, zinc, and protein. Spelt does contain gluten, but compared to wheat it’s much richer in nutrients and more easier to digest than wheat. I like to make Gracie mini pizza’s out of the recipe as I think it’s easier for little hands. We’ve been on Chef Steps again (one of my husbands favourite websites!) after making the appletouille which was a huge hit I wanted to make something that was AIP compliant but also the whole family could enjoy. As anyone on AIP knows you have to cut out all nightshades, which means no tomato sauce, so we’ve come up with our own version which is just as delicious. My husband found this recipe the other day and has been dreaming of making and eating them ever since. These came out absolutely amazing and we had so much fun making them! Meanwhile, to make the filling, put all of the filling ingredients into a food processor and pulse it a few times until it’s all quite finely chopped and evenly combined. Working one at a time put a heaped tsp of the filling into the centre of a wrapper. Wet one half of edge of the filling side of the circle and gently fold it in half around the filling. Carefully fold along one side of the semi circle so that the front is crimped onto a flat back. Press the crimps to the flat back to seal the dumpling and very gently plump it out at the bottom so that it can sit up right. Repeat with the remaining wrappers. Pour about 2 cups of water into a large wok with a bamboo steamer. Place it over high heat and bring the water to simmer. Gently place the gyoza's into the steamer, cover with the lid. Leave to steam for 6-8 minutes and then gently remove the gyoza with a spoon. If you want them a bit crisp, heat up the remaining 2 tsp of oil in a large frying pan and place the cooked gyoza in. Let cook on one side for about 4 or 5 minutes until they’re crispy and golden, and then flip them over to brown on the other side. Repeat until they’ve crisped up to your liking. Server with extra coconut amino's for dipping sauce. I’m a one pot wonder kind of girl so this recipe really hits the spot, even better you can cook it slowly while you sleep! It’s extremely tender because it’s slow cooked on a low temperature for 12-13 hours and is covered to prevent evaporation and drying out. Tip: Use the leftover coconut milk, to make coconut rice. My husband bought a tray of lovely heirloom tomatoes from Flemington Markets. Some of them were already pretty over ripe so we decided to make a quick and easy tomato sauce which can be used as the base for many other delicious meals. Even better it’s cheap to make, you can control the sodium levels and no refined sugar like the majority of store bought sauces contain. 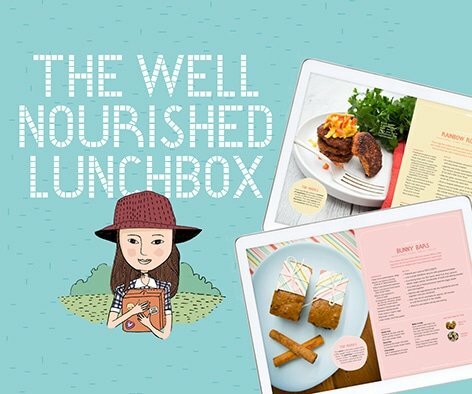 This meal is actually far more simpler than it sounds and it’s a great way for children to be exposed to different flavours. The Dosa recipe has been sourced from the latest Taste.com.au magazine. DOSA: Place flour, bicarb and cumin in a bowl. Season and whisk in water until smooth and set aside to rest. Heat a 24cm (base measurement) non-stick frying pan over medium heat. Brush with coconut oil. Add 1/2 cup batter to pan to cover base (add extra to fill any holes). Cook for 2 minutes or until edges start to curl, turn, cook for 1-2 minutes, until golden. Turn again, cook for 1 minute or until crisp. Repeat with remaining batter and ghee. Spaghetti Bolognese is a great way for boosting children’s daily vegetable intake. I like to make ours in big batches so I can freeze into smaller portions to make quick meals in the week. Our favourite is with Pork and Veal mince and I like to make ours with chicken bone broth for an extra nutritional boost. I try and simmer mine for an hour as I find it really makes the flavour much more richer. One of our go-to meals for Gracie are Chicken Nuggets, except these are dairy, gluten and egg-free and packed full of nutrients – winning! Nutritional Yeast is deactivated yeast and has a cheese like flavour. It provides a natural source of Vit B.
I love cooking with mince meat as it’s so versatile and a great way to hide veggies. This is a really simple and delicious recipe that is packed full of secret goodness and is a fantastic option for children (and adults!) who have food allergies and intolerances. Quinoa flakes are a great gluten-free substitute for breadcrumbs. Quinoa is a highly nutritious grain-like seed that actually provides all the essential amino acids needed by the human body! Nutritional flakes is an inactive toasted yeast. Has a cheese-like flavour and provides a natural source of vitamin B complex and protein. Great way for using up left-over vegetables in the fridge. For a firmer mixture you can use an egg and swap Quinoa flakes for breadcrumbs if you like.